We all experience stress in lives but did you know that Chronic Stress has been linked to numerous physical and emotional disorders? Constant Stress can result in symptoms throughout your entire body. Studies have shown that Therapeutic Massage can have an immediate and noticeable Stress Relieving effect. Caron Chiropractic Clinic, P.A. has Licensed Massage Therapists at our St. Paul, MN clinic with expertise in several massage techniques that provide stress relief. 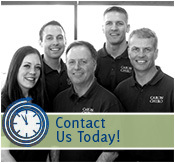 Licensed Chiropractors at Caron Chiropractic Clinic in St. Paul, MN offer Non-Surgical treatments for relief of Carpal Tunnel Syndrome symptoms. We provide a thorough examination to rule out other causes of the pain, numbness or weakness that can come from carpal tunnel syndrome. This is probably the most common work related injury and nerve disorder known in Minnesota. Carpal Tunnel is most prevalent in women and is usually a Repetitive Stress Injury. Conservative Treatments such as chiropractic care should be tried before considering a highly invasive surgical option.